In the Summer of 2006 I was asked to be the keynote speaker for the North American Conference of Separated and Divorced Catholics being held at Notre Dame University. As coincidence would have it, I had been asked by Emilie Cerar, the editor at Resurrection Press if I would write a book for separated and divorced Catholics! 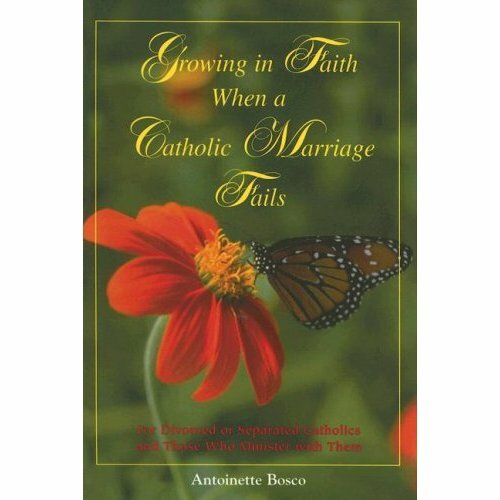 I agreed to do this, of course, emphasizing that the theme would be on "Growing in Faith When a Catholic Marriage Fails." She agreed, and that is the title of my book, with a sub-title, For Divorced or separated Catholics and Those Who Minister With Them. I know I could visit any Catholic parish in the country and find hurting people facing the end of their marriage. They are learning, a I have learned, that life doesn't come with built-in guarantees that all will be well at all times. They expected to live "happily ever after" but were catapulted into a new life situation they were completely unprepared for. What I learned, and am sharing with others in this book, is that we can find resources within ourselves that we never knew we possessed, personal powers given to us by God, which can, even though sometimes with difficulty, move us from our darkness to blossom in joy. We must ask our Church to work with us, helping us rebuild our lives in faith.